Today, thanks to a Twitter-inspired digital rabbit hole, two of my kids and a friend attended the first-ever Tulsa Mini Maker Faire. * It was an hour and a half drive for us from Oklahoma City, but despite the rain it was worth the trip! Here are a few of the things we learned and did. This was a delightfully eclectic and inspiring time of learning and fun! Our adventures started at the booth of Sew Sarah Designs, where Rachel tried her hand (for the first time EVER) at sewing a simple felt bracelet. Sarah immediately got Rachel’s attention when we walked up, asking if she wanted to “make a bracelet.” Woo hoo for the spirit of the MAKER Faire! Next, we learned about a VERY cool iPad remote-controlled robotic car Patrick Forringer is still in the midst of creating with a raspberry pi computer ($35) and parts he’s manufactured with a 3D printer. (A few are also from Radio Shack, I think.) He calls it the MEP (short for “Mecanum Educational Platform“) and has more details on mothtom.com. You can see Rachel controlling it with an iPad in this photo. The MEP creates a local wifi hotspot, similar to the commercially produced Parrot AR Drone. Patrick is coding the software for the MEP himself, and has the required equipment list down to about $300. This was one of the coolest and most inspiring things we saw all day at the Tulsa Mini Makerfaire. Next Alexander tried his hand playing chess on a large touch-flatscreen TV, which was remotely connected to a grid supercomputer running the Scorpio chess engine (free) running at the Tandy Supercomputing Center in Tulsa. 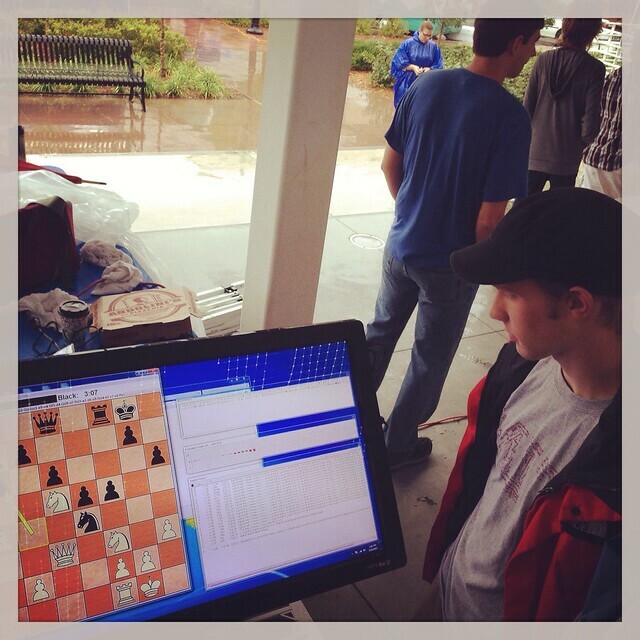 The TSC is a new nonprofit “providing access to academic, corporate, and government entities needing high performance computational capabilities.” The chess program was a quick way to get an interactive, AI-based program running for the Maker Faire which would showcase their capabilities. If you’re an Oklahoma educator, I encourage you to get in touch with the TSC staff. They are eager to do outreach with and for K-12 students and are just getting started! 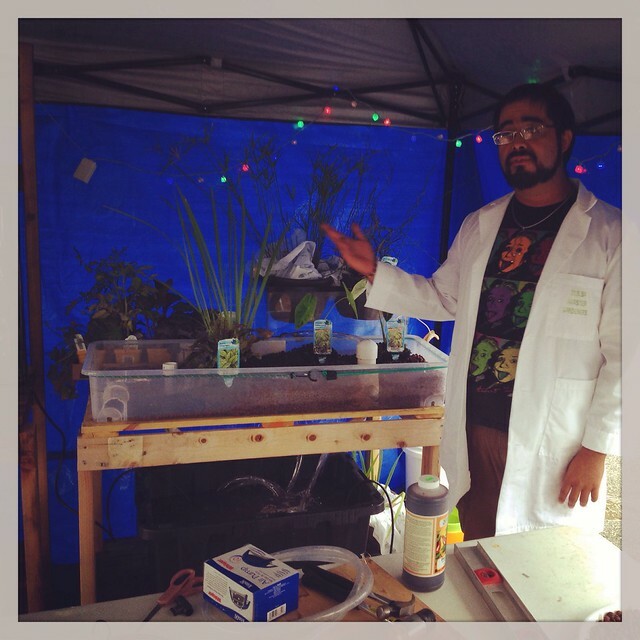 One of the coolest demos we saw today at the Maker Faire was this one about “aquaponic gardening.” Using a tenth of the water normally required, agronomists around the world are using small clay-fired pellets as a soil-substitute to grow a variety of different plants (including fruits and vegetables) as well as raise fish like Koi. 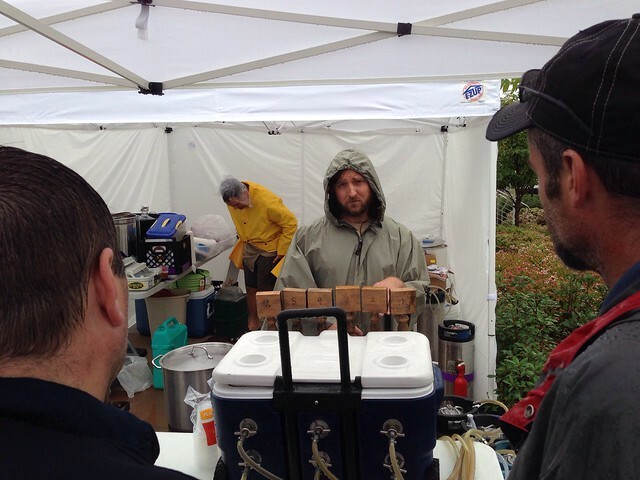 One of my favorite booths of the day was sponsored by the Fellowship of Oklahoma Ale Makers. They offered free samples of many different flavors… yum! Steampunk is a sub-genre of science fiction that typically features steam-powered machinery, especially in a setting inspired by industrialized Western civilization during the 19th century. Steampunk works are often set in an alternative history of the 19th century’s British Victorian era or American “Wild West”, in a post-apocalyptic future during which steam power has regained mainstream use, or in a fantasy world that similarly employs steam power. Steampunk perhaps most recognizably features anachronistic technologies or retro-futuristic inventions as people in the 19th century might have envisioned them, and is likewise rooted in the era’s perspective on fashion, culture, architectural style, and art. Such technology may include fictional machines like those found in the works of H. G. Wells and Jules Verne, or the modern authors Philip Pullman, Scott Westerfeld, Stephen Hunt and China Miéville. Other examples of steampunk contain alternative history-style presentations of such technology as lighter-than-air airships, analog computers, or such digital mechanical computers as Charles Babbage’s Analytical Engine. 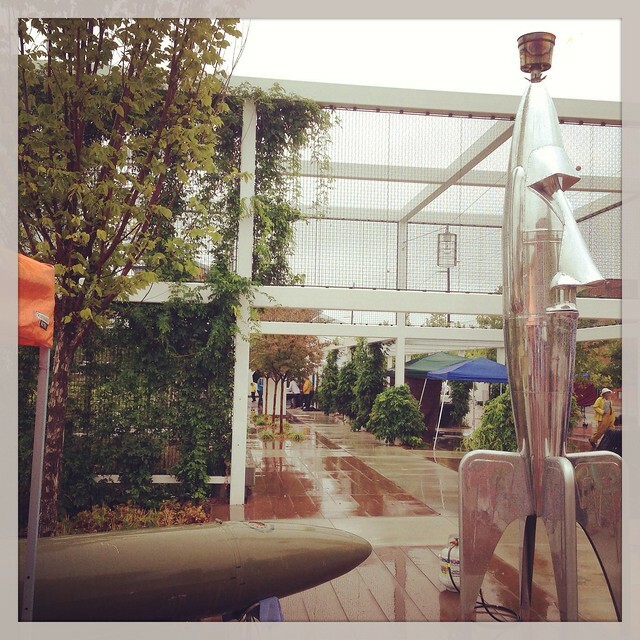 The F-4 fuel tanks converted to artistic tiki torches were definitely something you don’t see everyday. 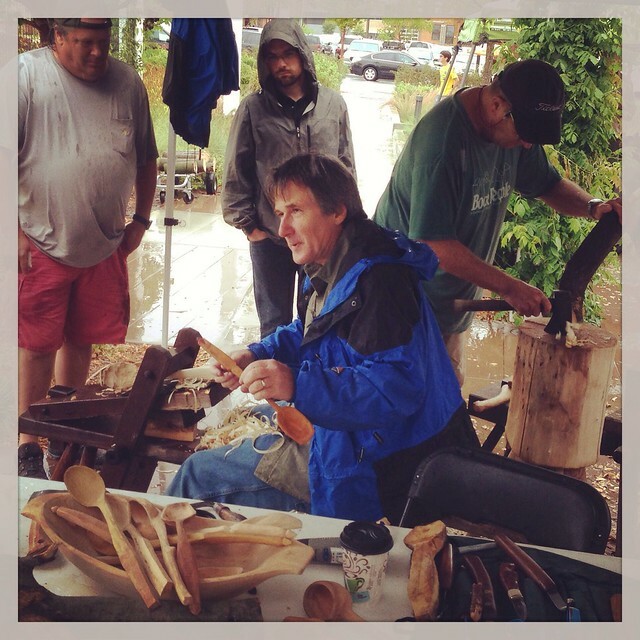 Last of all, it was fun to visit with a wooden spoon carver and learn a bit about his craft, tools and methods. 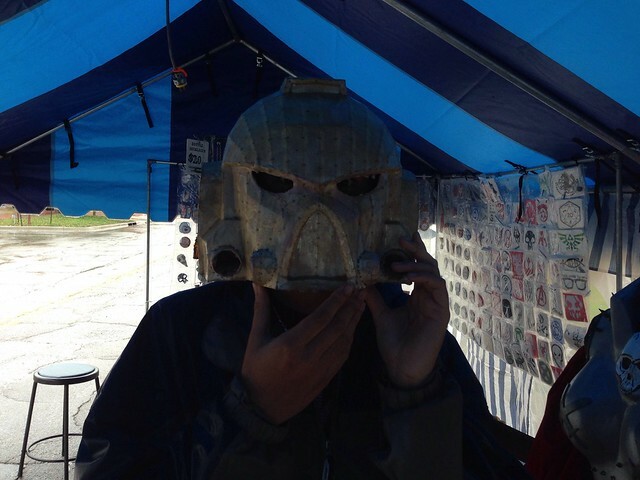 If you ever have a chance, attend a Maker Faire! The biggest one in our part of the USA is in Kansas City at the end of June, but it unfortunately conflicted with ISTE this year. There are thousands of people who attend it every year. We met some folks from Wichita, Kansas, today who work with MakeICT, which is a MakerSpace. 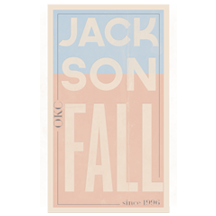 This entire event inspired me to find out more about and visit our Oklahoma City-area makerspaces. “Prototek OKC” (@prototekokc) is an “Oklahoma City Machine Shop and Makerspace Community,” and they also have a MeetUp group. Their next meeting is Tuesday, October 1st, in fact! I am sure this isn’t the last Maker Faire our family will attend. Many thanks to all the organizers and participants in this year’s Tulsa Mini Maker Faire! 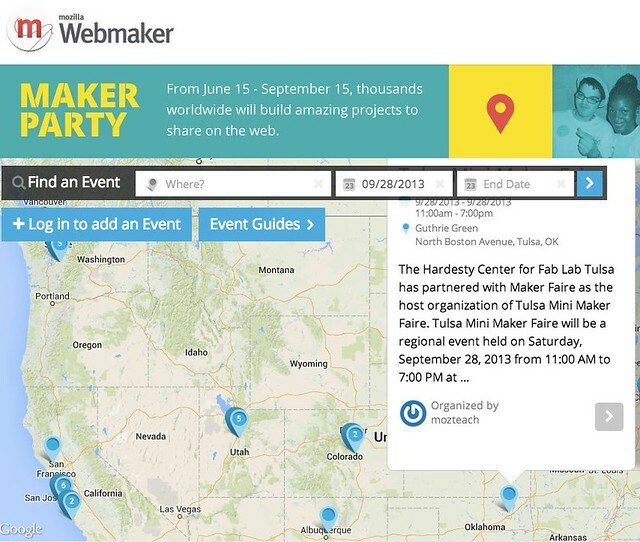 — The WebMaker Events page, which listed the Tulsa Mini Maker Faire! ADDITION: I used the free iPhone app “Shadow Puppet” to create a short narrated slideshow this morning with some of these photos. I added “Shadow Puppet” to the list of iOS apps on the Narrated Slideshow / Screencast page of Mapping Media to the Common Core. Shadow Puppet was fast and easy to use, I actually created this after we boarded our aircraft for Atlanta this morning in Oklahoma City. I like how it permits users to zoom into an image while narrating it, and also double tap to show an area for emphasis during the narration. I chose to login with my Facebook account rather than create an account manually. 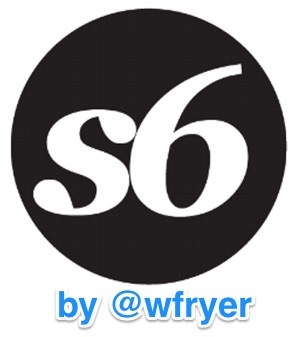 The auto-share to Twitter and Facebook options did NOT include the title I gave to the slideshow, however, so I had to delete those shares and re-share manually with titles. The feature of double tapping to show an emphasis area reminds me of the “laser pointer” effect available in Explain Everything for iPad. I REALLY like how Shadow Puppet provides hosting for projects. 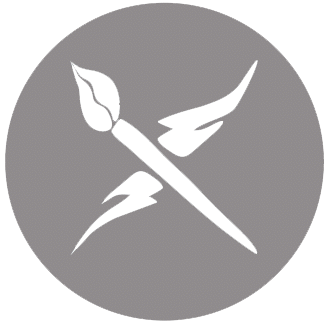 I’m not sure what the time limits are for single images or for entire projects, however. Hi, my name is Briann Smith, I am a student at the University of South Alabama. I am in Dr. Strange’s EDM 310 class. 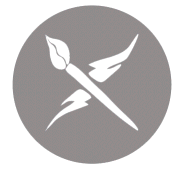 I also have a Blog, that I post for my class. 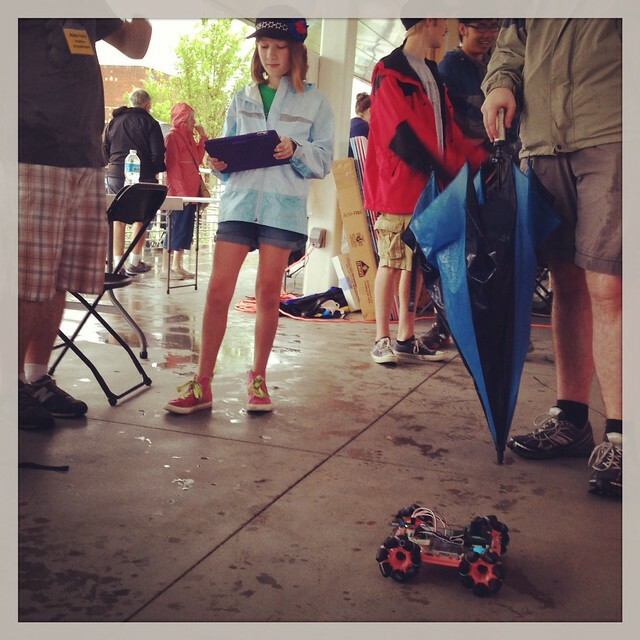 I really enjoyed reading your blog post on the 2013 Tulsa Mini Maker Faire. 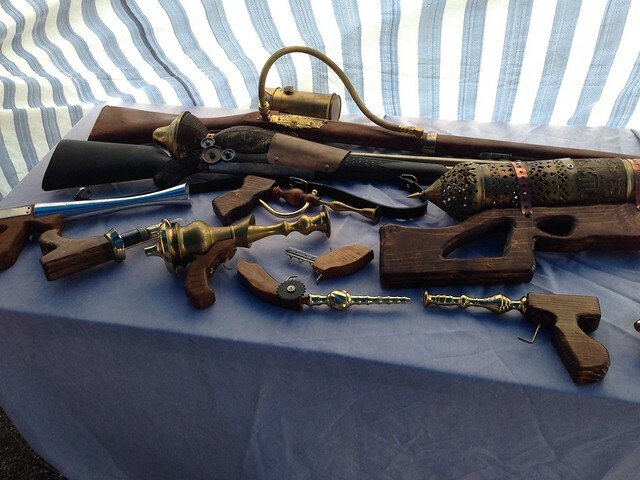 It seems like you and your family had a great time at the faire. I have never been to Oklahoma, but I will add the Mini Maker Faire to the list of places that I should visit. 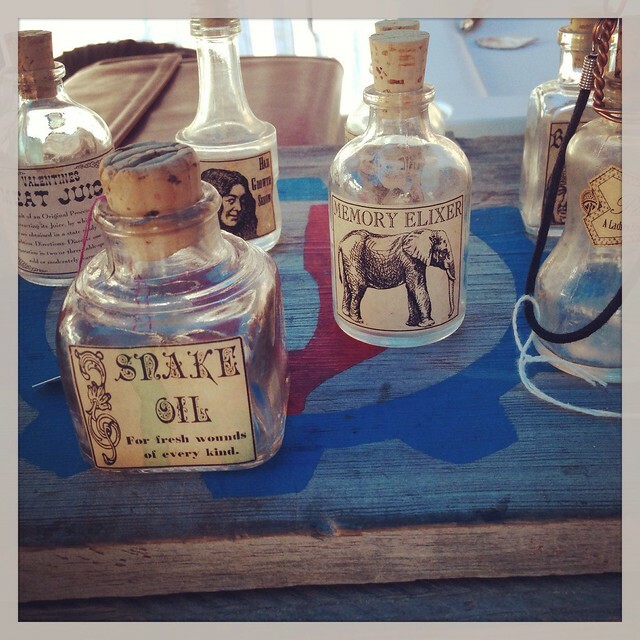 It’s incredible that the faire has so many innovative gadgets and products. The iPad remote control car was fascinating, I bet that would be fun to use. I know a lot of people who would love to use the iPad controlled car. My favorite part of your post was about the aquaponic gardening. That is incredible that they can grow plants from only using a tenth of the normal amount of water! It always amazes me what people can create by using technology. Once again, I enjoyed your post and I look forward to your future posts! 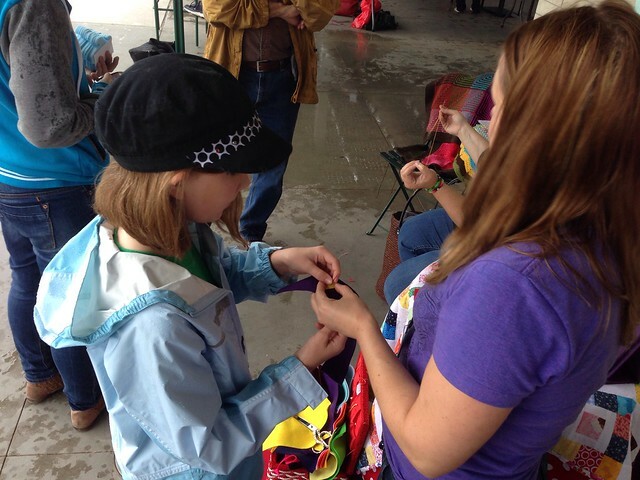 The Tulsa Mini Maker Faire seems like so much fun!